Congratulations and thank you for visiting the Medical Device Driving Licence website now owned and managed by NAMDET. We want to help you to provide certificated proof of your competence in using medical devices for your Personal Development Plan (PDP) and Continuing Professional Development (CPD). Successful completion of each session will generate a certificate for download to put into your own files and add a category to your own Licence. Certificates will then be stored within the secure database on this website. We have provided a short 8 minute presentation of the background to the Medical device Driving Licence. Just Click on the screen above to view this. If you have allready registered please login. 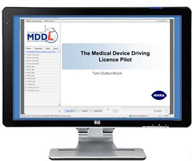 User registers with the Medical Device Driving Licence (MDDL). User is then issued a personalised unique login. User undertakes the Devices in Practice module followed by a short assessment. If successful this is recorded on their licence. User undertakes other modules as appropriate, along with their assessments. Successfully completed assessments are recorded on the licence. Users can access their MDDL records and print a copy for their personal records and as evidence for their personal development plan (PDP), for their continued professional development (CPD) and to give to a prospective employer. Where appropriate certain modules will expire and have to be renewed. As the scheme develops employers define appropriate modules to be held by individual employees and applicants. An employer will be able to demonstrate that employees have all completed medical device training to an appropriate level. The employee will have ownership of their MDDL and it will travel with them from Trust to Trust. This will help to save time and costs on unnecessary retraining.